Yesterday’s fed action that brought the markets down all the way to the 1960s was bigger than expected. However, the lows were not violated since then so that is a good sign for our ongoing prediction for the market. 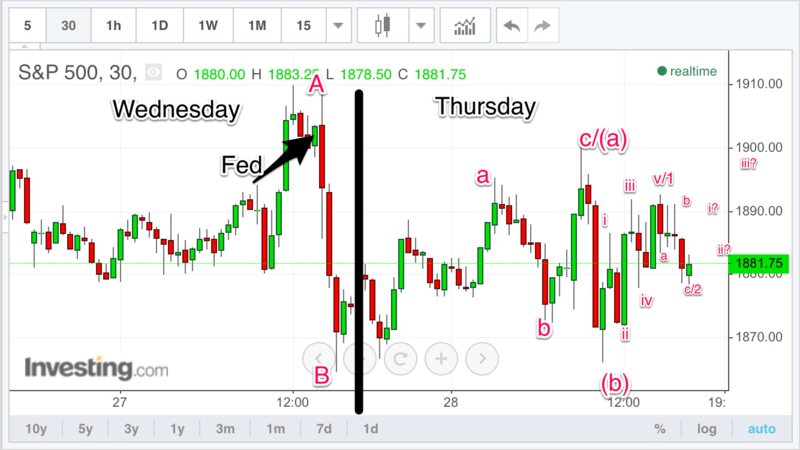 This morning we opened unexpectedly high over 1900 but retraced all of it in yet another b-wave down. From there, we got a 5 wave move up to 1892, then after the market close, Amazon reported earnings that helped put stocks down in a wave 2. Just as the market rebounded from the news-driven Fed drop as well as the earnings report of Amazon after the close, I think the market will continue shaking these off and finally lift off by end of tomorrow. We will see if that happens. Trades are still on track and we also initiated a new trade today in gold (GLD as well as the GC futures contract).